Former Department of Interior and Local Government Secretary Rafael Alunan posted on his Facebook account a letter from his German friend who lives in Europe. The open letter caught the attention of netizens which is now going rounds in social media. Michael Schaefer recognized the malicious and unfairly reports of local and international media. Schaefer slammed local media for their bias news. 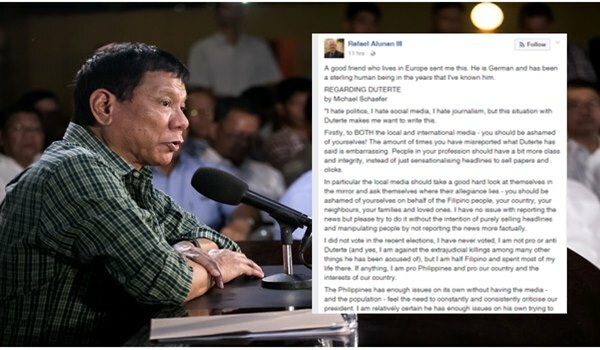 In his letter, Schaefer also attacked foreigners who are against Duterte. He said that they are free to express their opinion and thoughts, but instead of complaining why not leave the country. "I hate politics, I hate social media, I hate journalism, but this situation with Duterte makes me want to write this." Firstly, to BOTH the local and international media - you should be ashamed of yourselves! The amount of times you have misreported what Duterte has said is embarrassing. People in your profession should have a bit more class and integrity, instead of just sensationalising headlines to sell papers and clicks. In particular the local media should take a good hard look at themselves in the mirror and ask themselves where their allegiance lies - you should be ashamed of yourselves on behalf of the Filipino people, your country, your neighbours, your families and loved ones. I have no issue with reporting the news but please try to do it without the intention of purely selling headlines and manipulating people by not reporting the news more factually. I did not vote in the recent elections, I have never voted, I am not pro or anti Duterte (and yes, I am against the extrajudicial killings among many other things he has been accused of), but I am half Filipino and spent most of my life there. If anything, I am pro Philippines and pro our country and the interests of our country. The Philippines has enough issues on its own without having the media - and the population - feel the need to constantly and consistently criticise our president. I am relatively certain he has enough issues on his own trying to drive our country (a developing one, lest we forget) forward. For decades all I ever heard was that we needed a ‘strong’ president. That we needed an authoritative figure. Well guess what, we have one now, and now that we have him, I get the feeling everyone feels inclined to give their two cents about how the country should be run. Is Duterte perfect? Of course not. Has he made massive mistakes? Of course. Can you name me one global head of state that is? Of course not. At the end of the day, he is the president that was elected, regardless of whether you voted for him or not, I challenge many to try to actually work with him and the government to create a better country for all Filipinos - including, and especially, the ones less privileged. Lastly, I see a lot of foreigners posting and often complaining about Duterte, and the Philippines. Everyone is entitled to their opinion. I try to remind you however that at some point many of you spent time in the Philippines - for work, to live, to visit, whatever. I am sure that during that time you experienced more than enough respect shown to you BY Filipinos of all social classes. This is our country, it is not yours. Before you come on social media and complain about our country, do not forget, you are or were guests here. You are free to leave any time you want. We do not go to your country and complain about how your government is run - without even mentioning how many developed nations treat foreigners in their own countries. The last thing I will mention on this point is that we ARE a developing country, something that many of the developed nations tend to forget. Before passing judgement on how our president and our country is doing and does things, consider your own, often bloody history, before looking at how we do things. "Feel free to leave the country if you are not happy with it, nobody is asking you to stay."